In arts we see colors, images, characters, perspectives and history. It’s also through creative expression why Juan Luna, Fernando Amorsolo, Francisco Botong, Jose ‘Pitok’ Blanco, and Nemesio Miranda are famous. With Bayaning Bayan Project painting contest of National Commission for Culture and the Arts’ (NCCA) and Philippine Cultural Education Program (PCEP), Filipino painters of today, ‘around the globe’, can bring out their epic heroes and artistry. 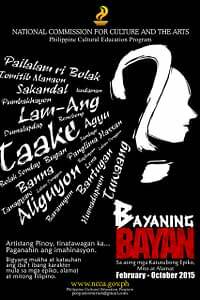 Entitled ‘Bayaning Bayan: Sa Ating mga Katutubong Epiko Mito at Alamat,’ NCCA and PCEP challenge professional and amateur painters to give images to known and unknown epic heroes of Philippine Literature. Dr. Galileo Zafra, consultant for literature for the Bayaning Bayan project, shared that the contest is indeed flexible, promising and vital in teaching students or all Filipinos about our myths and literature. He added that epic heroes have relevance to modern narratives of our lives like our Overseas Filipino Workers (OFWs), Fernando Poe Jr in his films and memories of Ninoy Aquino. “Kapag tinanong mo ang mga estudyante ngayon, mga estudyante ko, first day ng klase tatanungin ko sila – ‘sinong kilala ninyong fictional or literary characters?’ Nangunguna parati d’yan si Maria Clara, Sisa, at Dona Victorina. Parang sa loob-loob ko iisang libro lang ba ang nabasa ng mga estudyante na ito, Noli Me Tangere lang o El Filibusterismo? Kinakailangan na lawak-lawakan natin ang literary repertoire natin,” Dr. Zafra’s answer to my question on importance of learning Philippine Myths and Epic Heroes today. “Sa aking palagay malaki ang maitutulong ng project na ito, Bayaning Bayan , para mailapit sa mga estudyante natin ang mga epiko natin. Siguro bandang dulo puwede na itong maisa-komiks o kaya computer games gamit itong nga epiko natin,” Zafra said. Labaw Donggon and Baranugun from the Labaw Donggon Sulod of Panay. and Tuwaang from the Tuwaang of the Manobo. Don’t fret if you don’t know any of these mythical characters, Zafra gave references too so contestants will get to know their chosen epic hero (es). Bayaning Bayan painting contest is open for 18-year old and above Filipino artists. “For Mindanao participants, they may submit their respective artworks to Ms. Jeselyn Dela Cuesta on or before May 28, 2015,” a statement from NCCA. Rene Sanchez Napeñas, Head of the NCCA Public Affairs and Information Office (PAIO) at 527-5529 or 0928-5081057. E-mail at paio@gmail.com or pcep.secretarial@gmail.com. By the way, I have soft copy of Bayaning-Bayan Painting Competition official entry form. If you are interested to get your, just leave a message below. Mabuhay and let’s support this project!